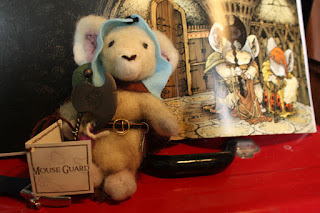 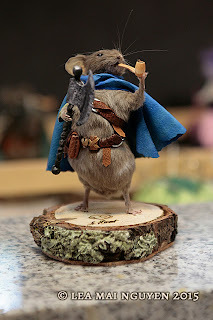 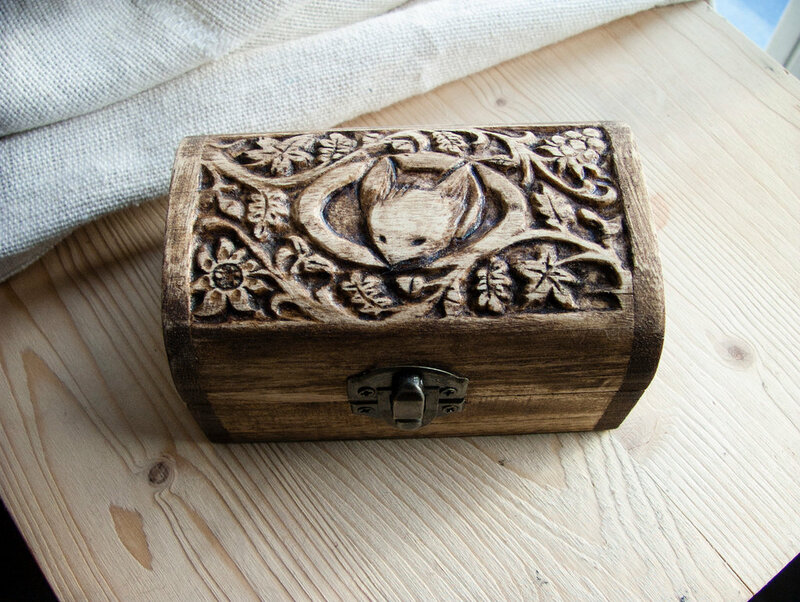 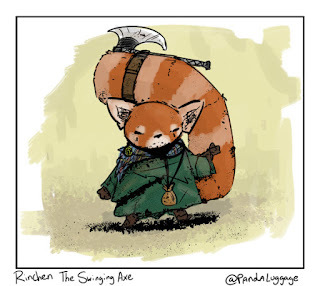 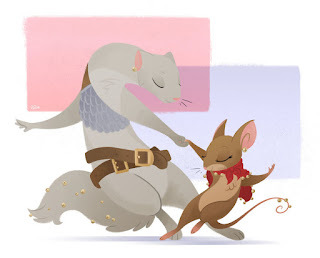 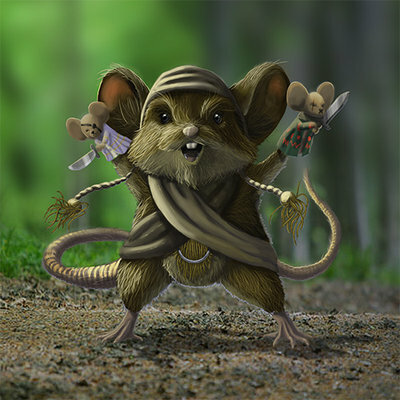 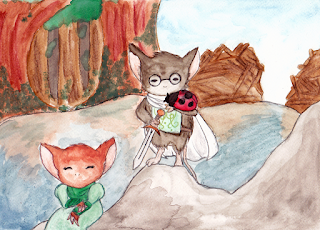 I love that fans are excited enough about Mouse Guard, Legends of the Guard, or the Mouse Guard RPG (and their player-characters) to lend their talents to creating Mouse Guard Fan Artwork! 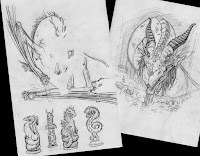 I share this work from time to time on the blog, so here is a fresh batch of work sent directly to me, or pointed out to me online by other fans. 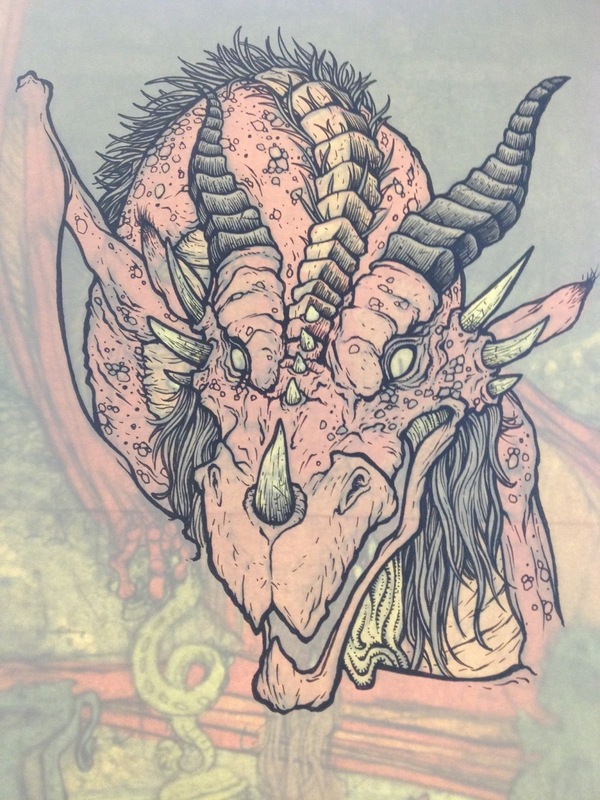 Every year the Baltimore Comic Con publishes an art book called the Baltimore Comic Con Yearbook where they feature a creator owned property that guests of the show can contribute a piece for honoring that series. 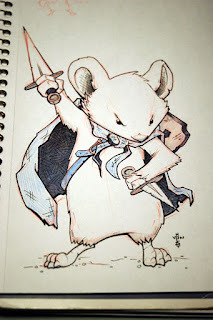 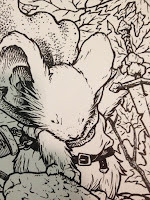 This year, I was asked by Marc Nathan if the theme could be Mouse Guard! With this being the 10 year anniversary for Mouse Guard, it couldn't have been better planned. To the left you can see the finished cover art I created for teh book. 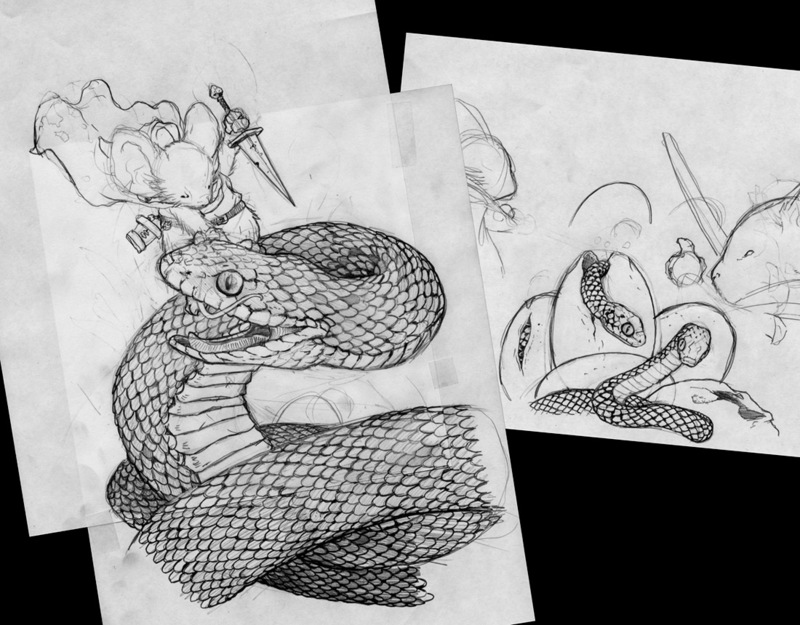 For today's blogpost, I'll run through the steps and process to get from concept to the final art. Concept/Sketches: I like to include another animal interacting with at least one mouse for any good Mouse Guard stand alone image. 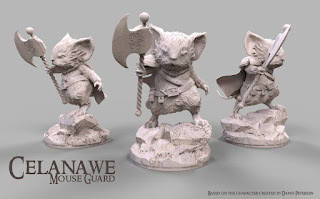 This way the sense of scale is featured, and if the other animal is a predator, establishes the tone of the Guard being brave work for such a small creature. 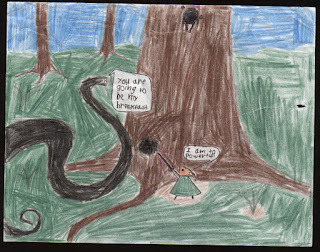 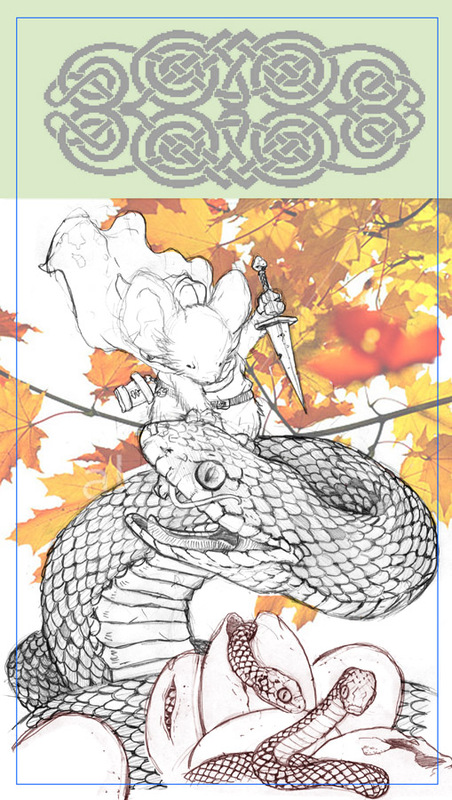 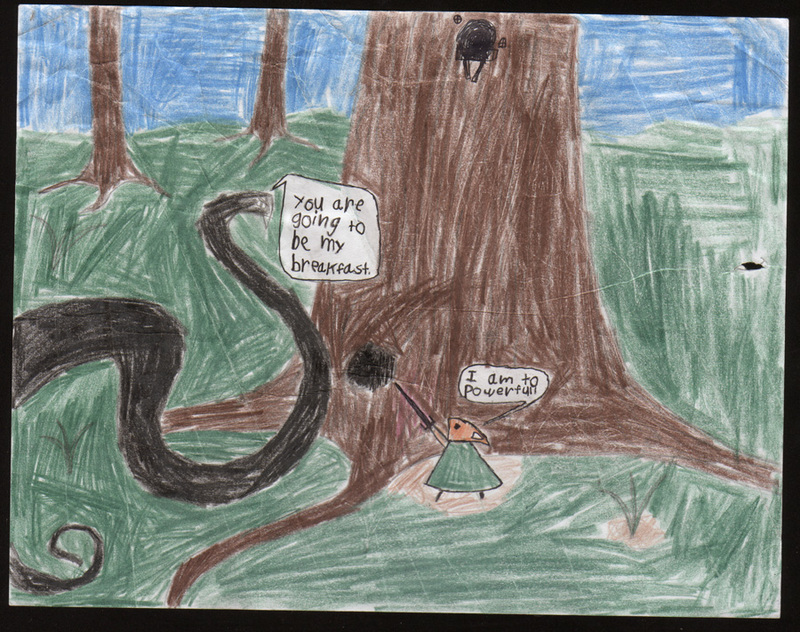 I decided to go back to the 1st interaction ever published for Mouse Guard and drew out a snake vs mouse battle. 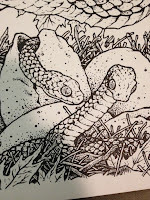 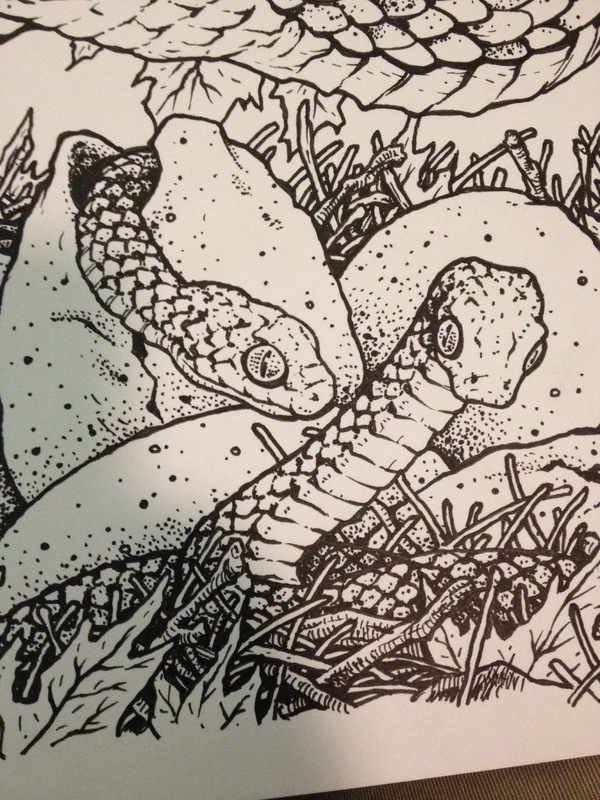 I also drew eggs hatching little snakes to also pay homage to the offspring Saxon and Kenzie encounter in issue 1 of Fall. Layout: I scanned the pencil sketches and started laying them out with the specifics of the cover dimensions worked up as a photoshop template (the trim, bleed, space for text, etc). 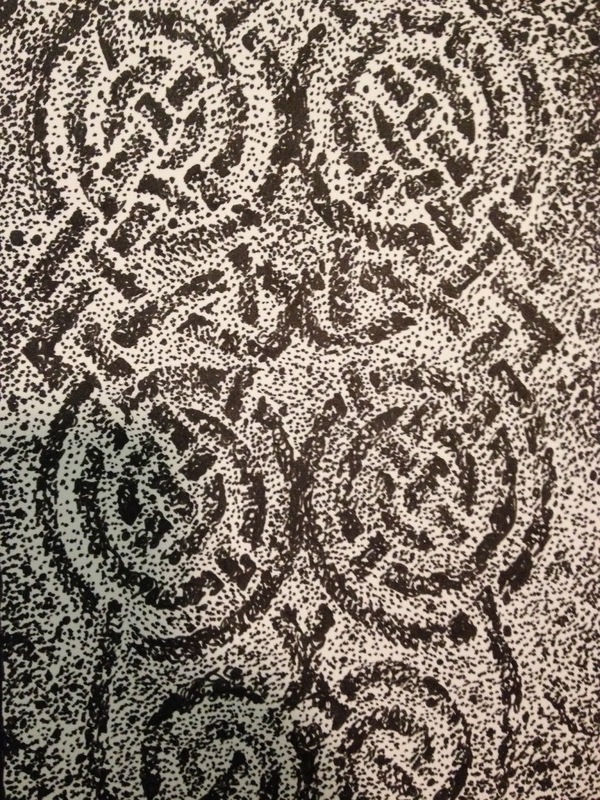 Where the text would go, I dropped in a celtic knot pattern I've used before (on the funeral shroud for Celanawe in Winter). 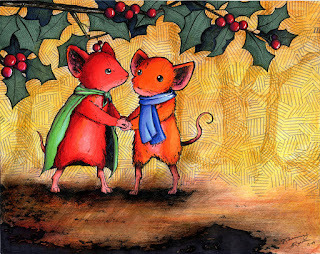 For the background I placed in a photo of a maple branch to see how detailed/minimalist I needed the background to be. 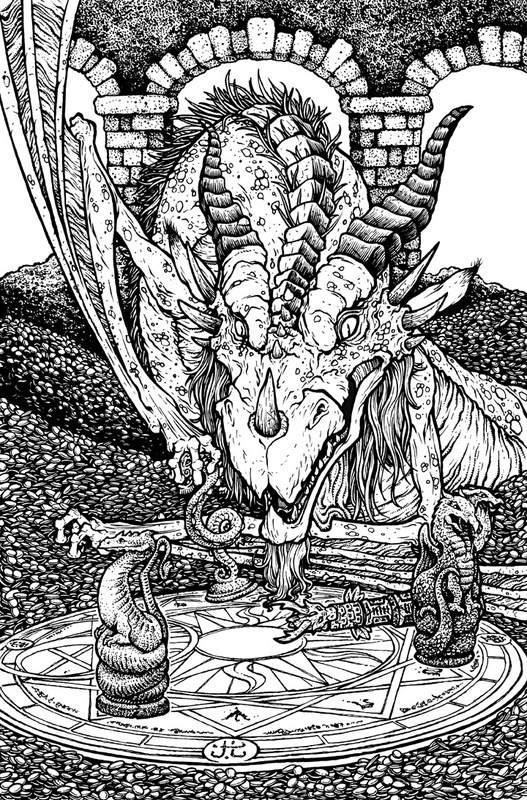 I was worried with all the scales, that a detailed background could get too busy, and using this photo as a placeholder helped confirm what I wanted to do. Inks: I printed out the digital workup for the cover and taped it to the back of a sheet of bristol board. On my lightbox I was able to see through the bristol board to the printout so I could use it as a guide to ink by. 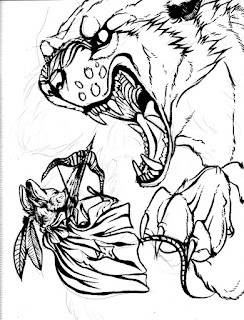 I used Copic Multiliner pens for the inks, the 0.7 & 0.3 nibs mainly. 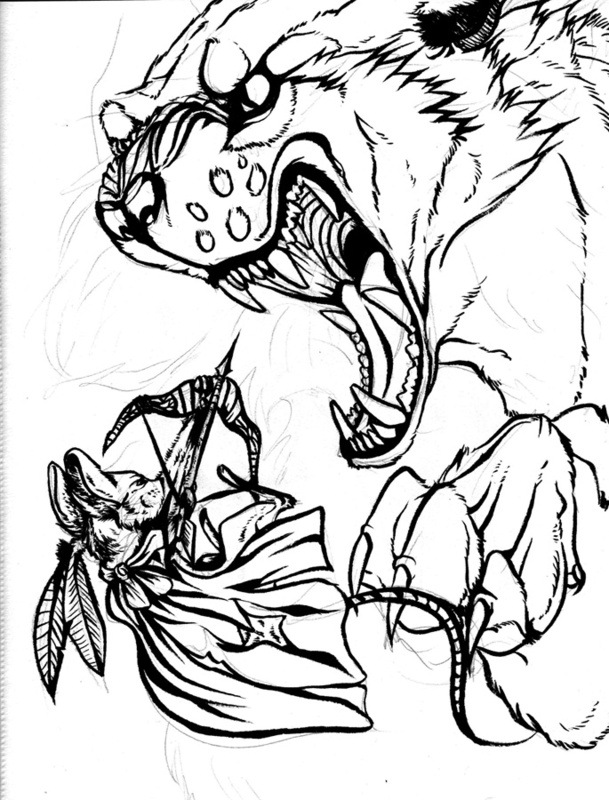 On the right you can see the final inks, but below are some of the process shots I took and tweeted as I inked. 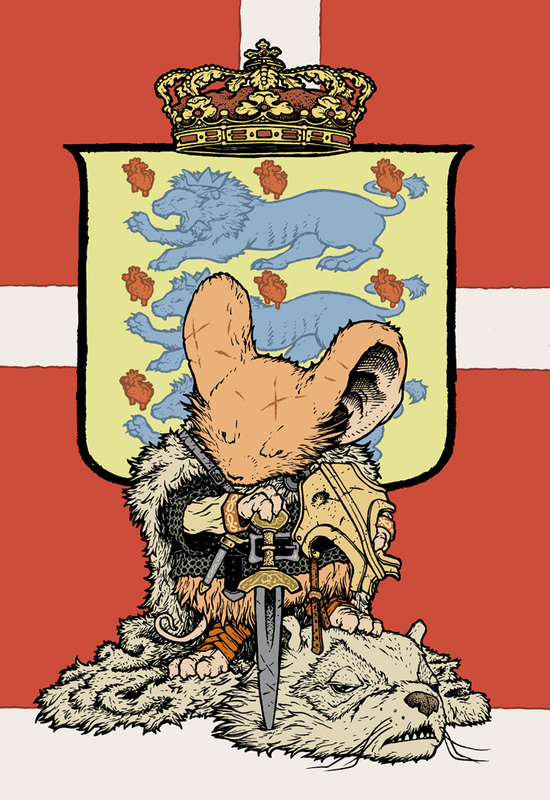 Flatting: I scanned the inks back into Photoshop and started to flat the colors in. 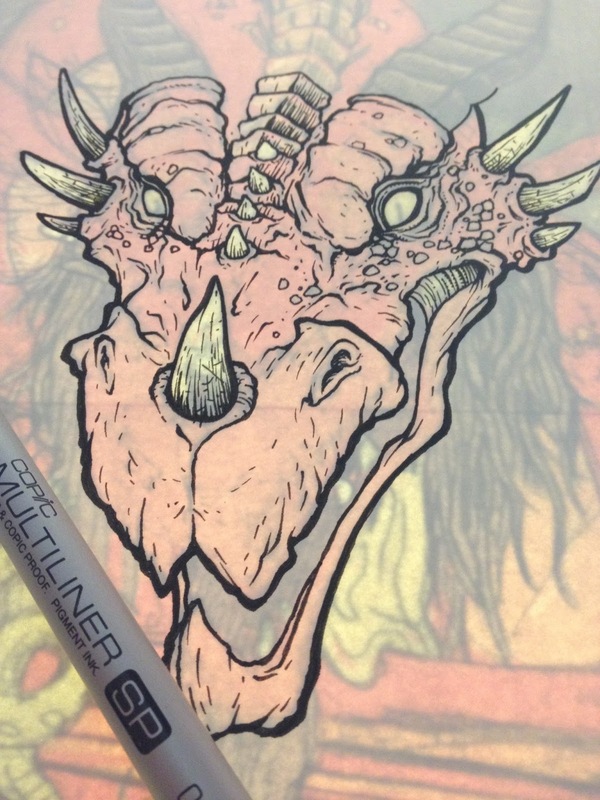 This is the step of coloring where you are just establishing what areas are which colors. 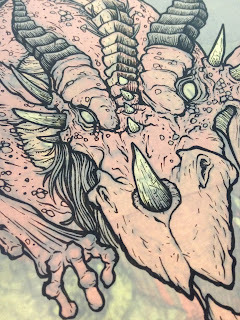 Not to worry about light sources, texture, or shading...just flat colors. 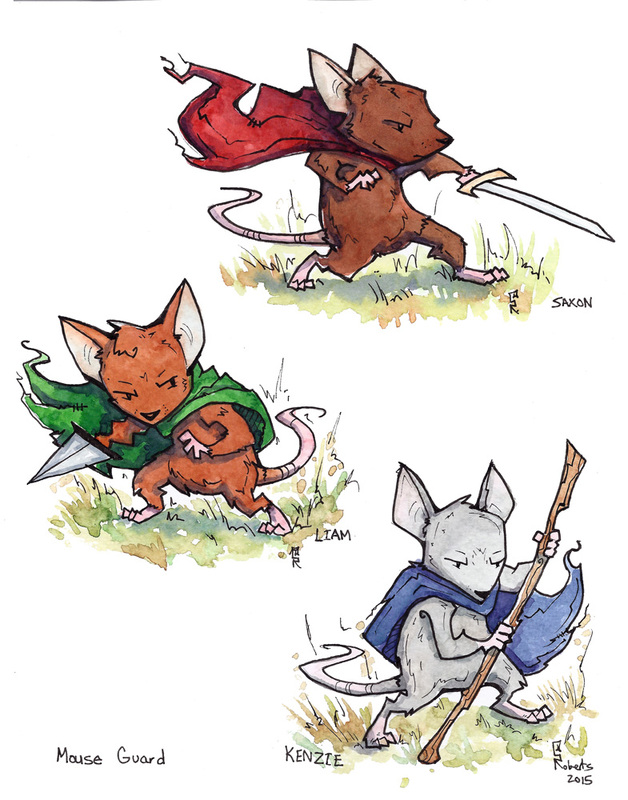 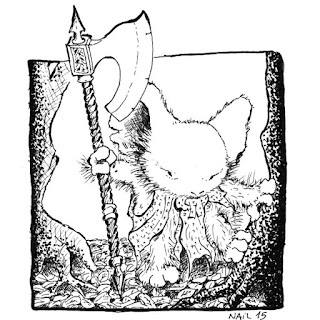 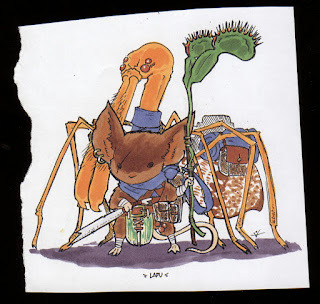 I wanted the palate to be reminicent of Fall, and while some of the costume details and the sword are off from Lieam's first appearance, I made the mouse Lieam in every other way to harken back to that first issue in 2005. 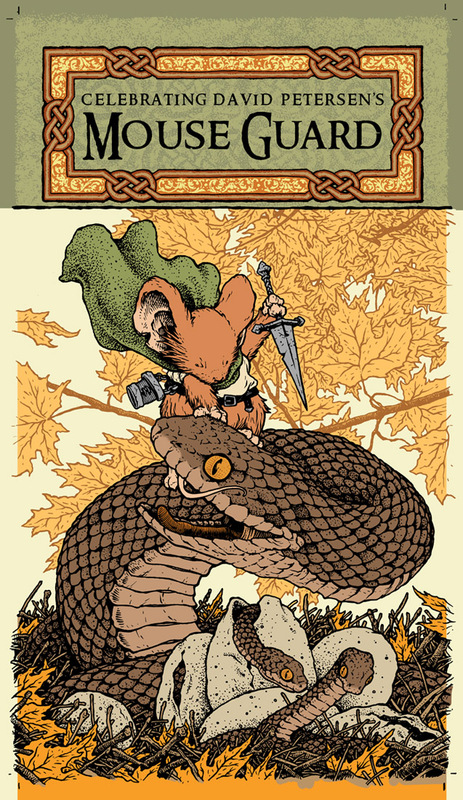 The border around the text was something I inked seprately on a different sheet of bristol so I could easily isolate it color-wise from the stippled celtic knot on the main image. 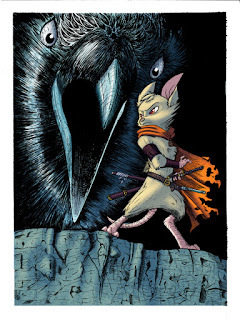 Final colors: I rendered the colors using the Dodge & Burn tools in Photoshop, but by using the paint brush tool. 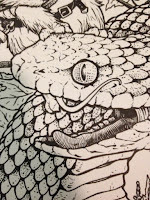 After I get the light and dark shading and highlights, I go through and select repetitious forms to tint and adjust so that they look a bit more natural (like the snake scales and the maple leaves). 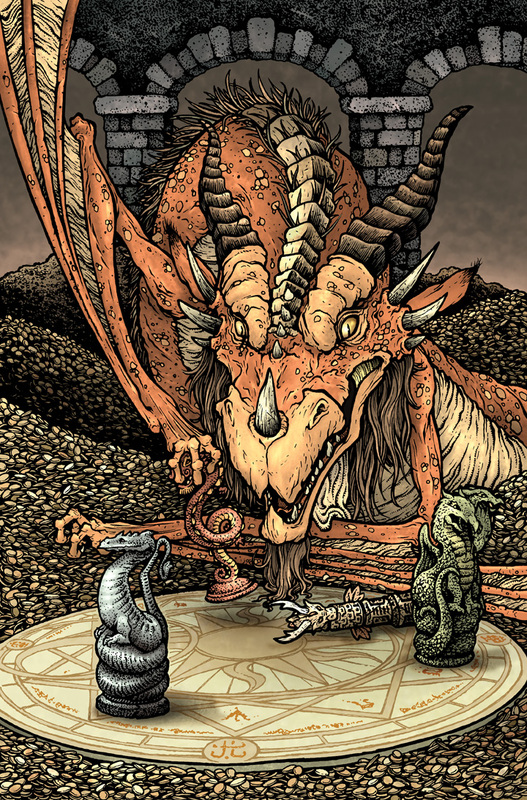 Archaia is doing a Jim Henson's Storyteller mini series with the subtitle DRAGONS. 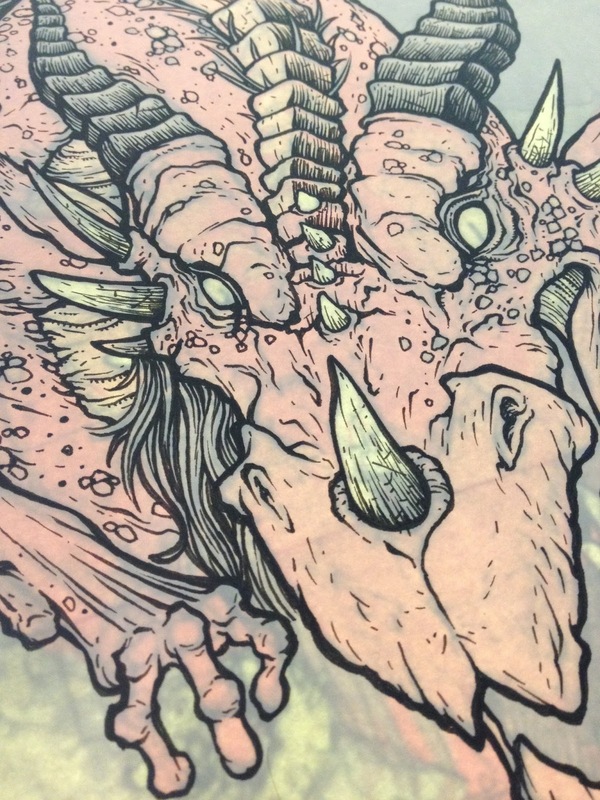 The 4 issue series will have an original Dragon themed story per issue drawn and written by the likes of Nate Pride, Hannah Christenson, and Jorge Corona. 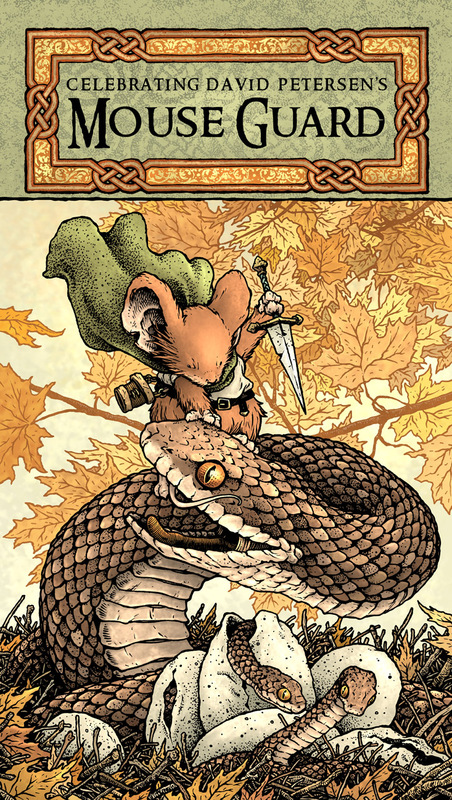 I was asked by my Mouse Guard editor Cameron Chittock (who is also the editor for Storyteller) to contribute a variant cover. 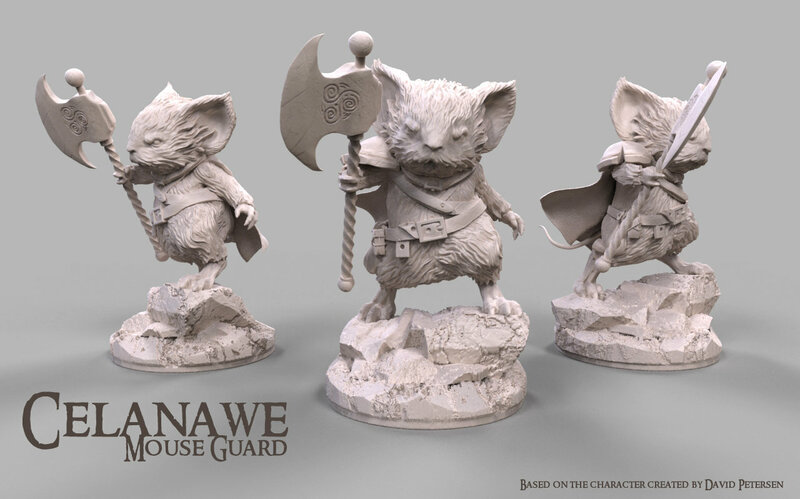 To the right you can see my finished cover, but below I'm going to share the process for creating the artwork from start to finish. 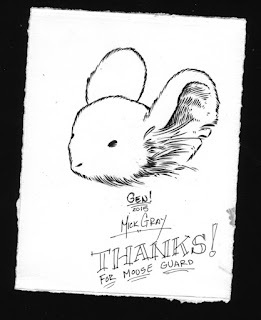 Rough/Pencils: I scanned and assembled my copy-paper pencil drawings in photoshop into a template for the cover. I merged the two dragon drawings and then digitally painted out the setting roughly. 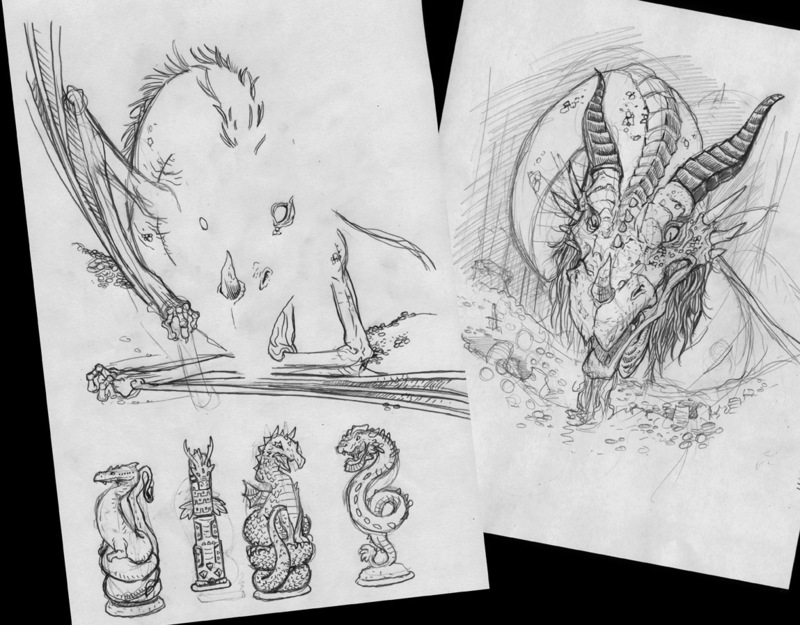 The horde of coins gave me a chance to have lots of tiny details...but not really detailed, because they are just repetition of form...and to hide a great deal of Dragon anatomy I didn't want to figure out for this new creature design. 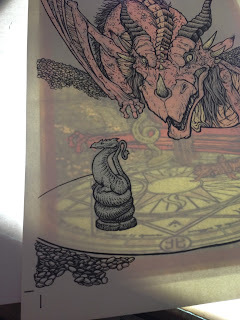 The magical chess-board was digitally distorted in from a traditional old magic circle drawing. This is what I then sent off to Cam for him to also show the Henson company for approvals of my concept. 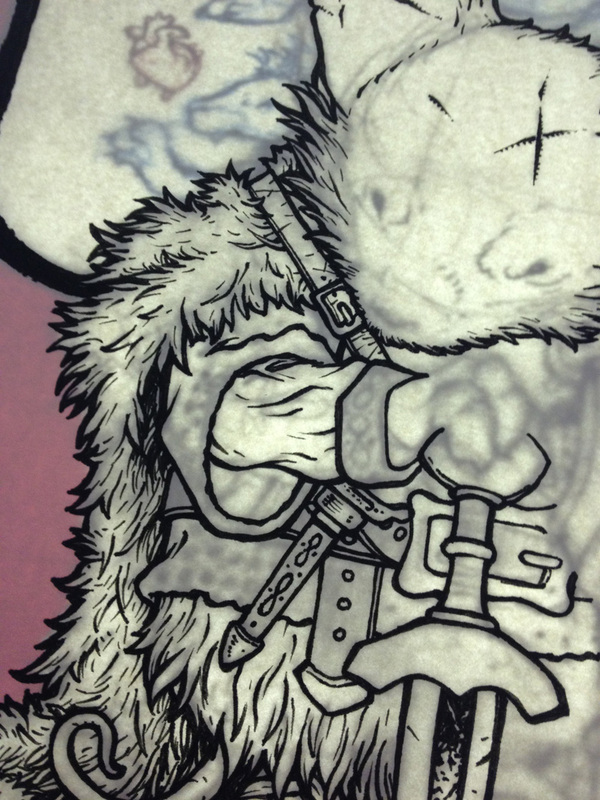 Below you can see a number of in-process photos I took as I inked the cover on my lightbox. 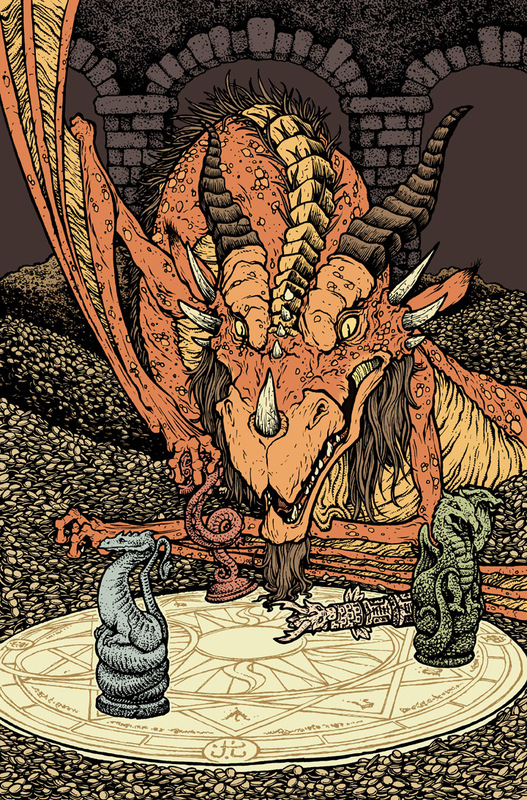 Flats: This part of the coloring process is just about establishing the various color areas...that the dragon's skin is a different color than his wing flaps, or eyes, or horns, and that the coins are a different color than the background, etc. 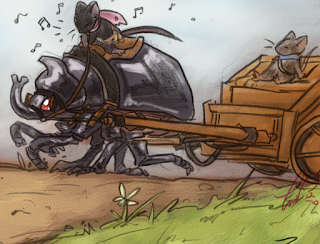 I'd already made a great deal of my color choices when I did the rough, so this step was mostly about the kindergarden-like task of coloring the right colors inside the lines....but digitally. At this stage, I also added a color hold to all the linework on the board to make it a bit more subtle. Final Rendering: The last step is to render, shade, highlight, and add texture to the flat colors. 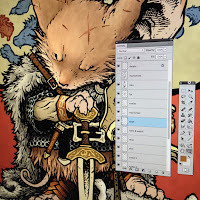 I do most of this using the dodge and burn tools in Photoshop with a textured brush. 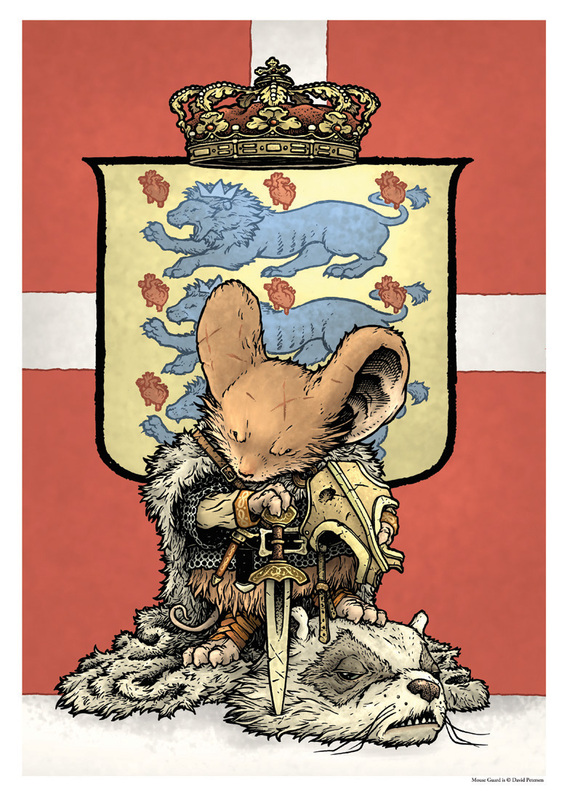 This November, I'll be a guest at the Art Bubble festival in Copenhagen, Denmark! The organizers there asked if I'd create a special print for the festival (as I've done a few times in the past for International visits like the UK and Germany). 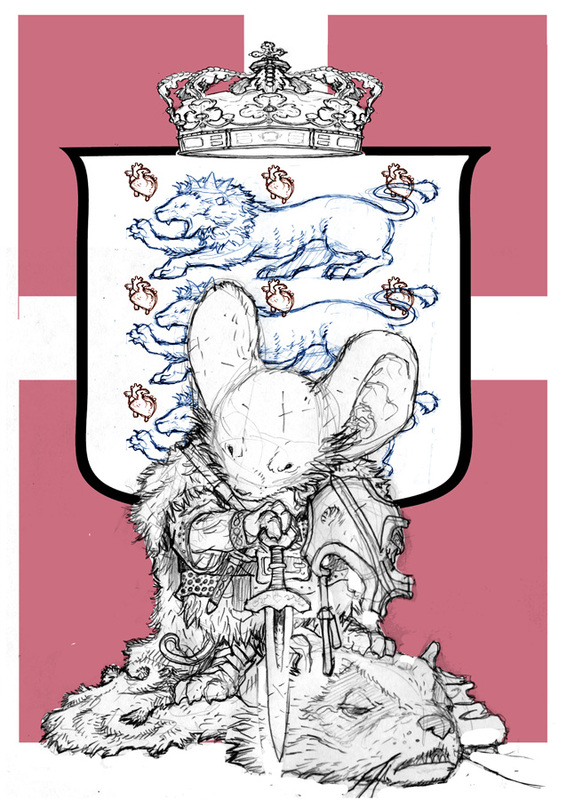 A good part of my background is Danish (my great-great-grandfather was Johannes who came from Denmark to Michigan). 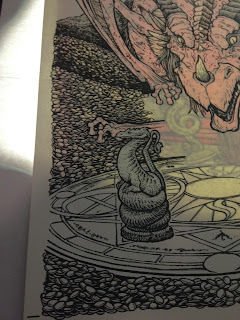 On the left you can see the final print image. In this week's blogpost, I'll be sharing all the step-by-step process for creating it. 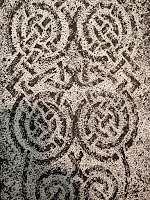 I wanted the print's image to be inspired by Danish heritage and symbolism. 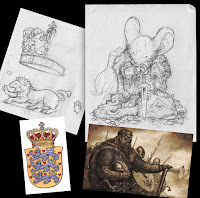 With an image search, I found the national coat of arms (three blue lions with nine hearts) as well as some fantasy art of Danish Vikings (I can't find any credit for the artist...anyone know). 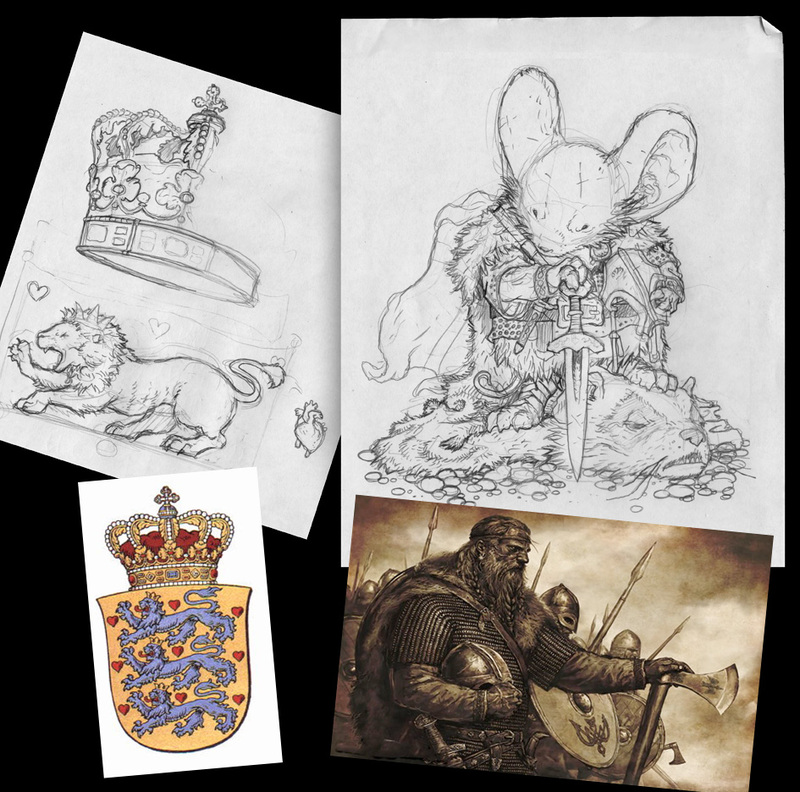 And with the plan of the background being the Danish flag, my version of the coat of arms, and a viking mouse, I sketched out these drawings on copy paper. 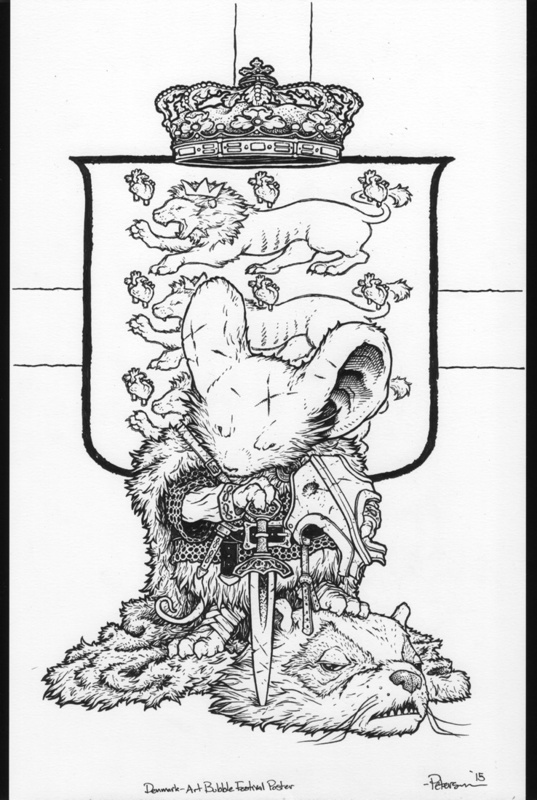 I only drew 1 lion and 1 heart, as well as just half the crown, planning to use Photoshop tricks to make sure the patterning matched and was was symmetrical. 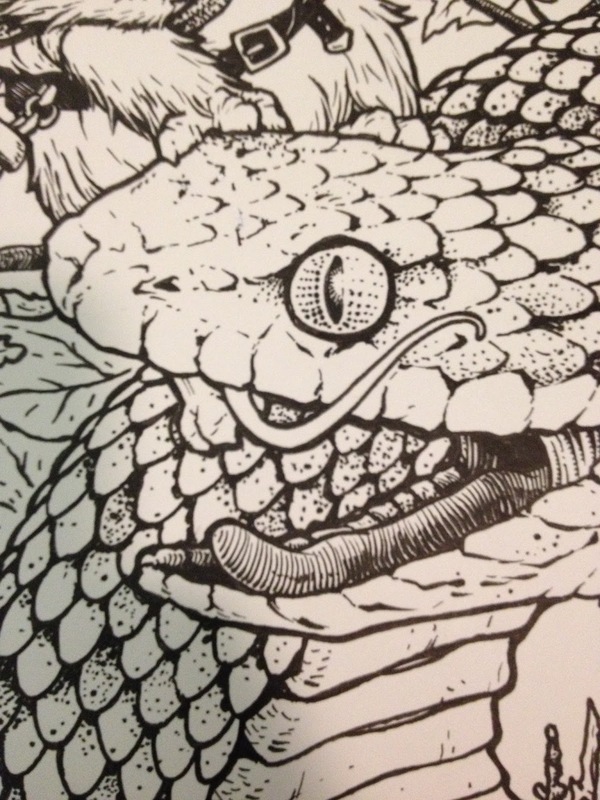 To the left you can see the scan of the finished inks. 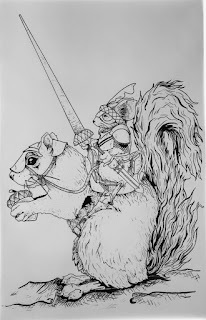 Because I inked this all on the lightbox, there were no pencils to erase (though I did make an adjustment to the hand holding the helmet that I sketched out on the bristol, so there was a tiny bit of erasing to do). For pens, I used Copic Multiliners...the SP 0.7 and 0.3 nibs. 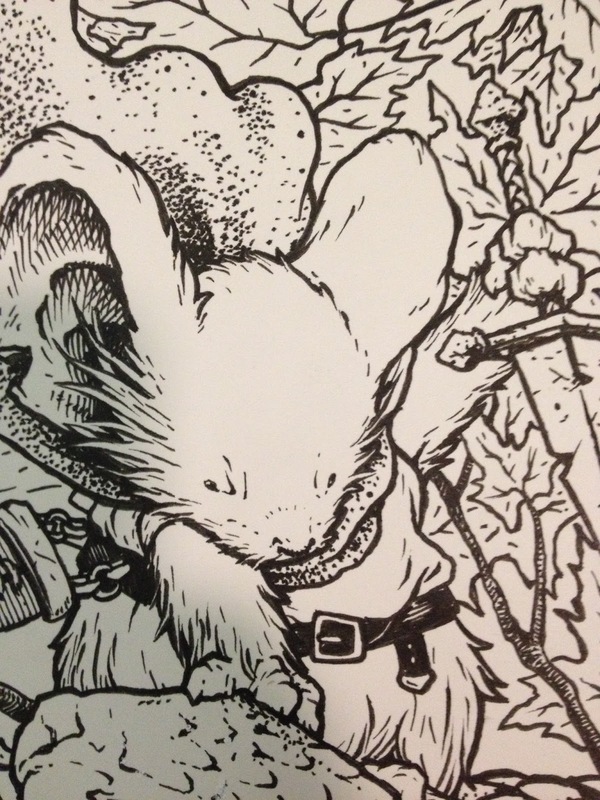 I always try to give my work texture in the inks. 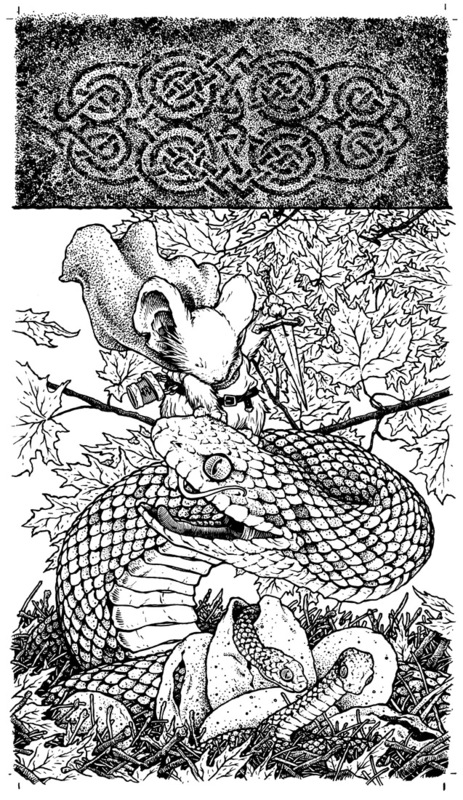 Beyond the obvious hatching and stippling, you can see some pattern work and line-type variance: the ring-mail, the cuts on the mouse's head & ears, and the lions & hearts. 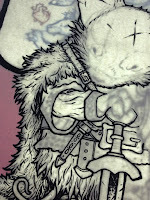 With the inks scanned, the tedious job of coloring known as flatting was ahead of me. 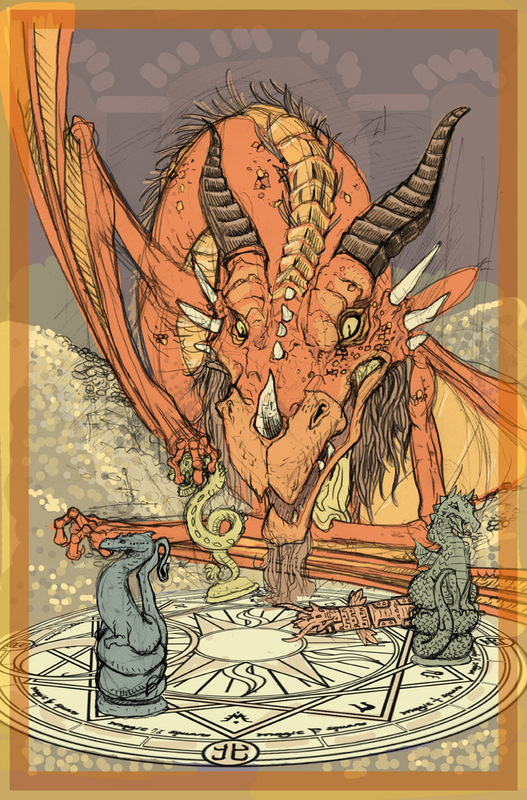 This is the part where I just have to drop in flat colors (no rendering, shading, or texture) to establish which parts of the image are which colors. on this piece, I did get close to the final colors in the flatting, but there are lots of times I use garish made-up colors as I flat. I added color holds in this step as well. 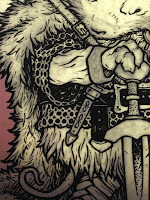 A color hold is where inked linework gets painted in color instead of black. 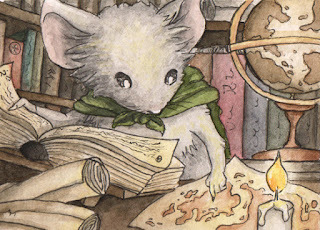 The exciting part of coloring is all the rendering and detail work. 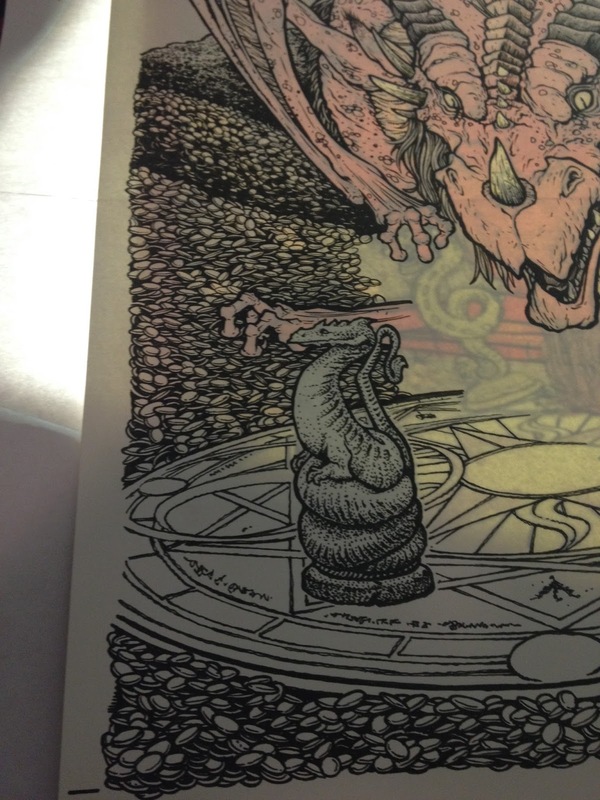 To the left you can see a photo I took of my screen as I was working. 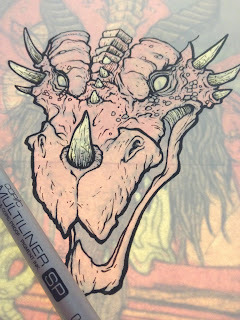 For all the shading and highlights I use the burn and dodge tools. 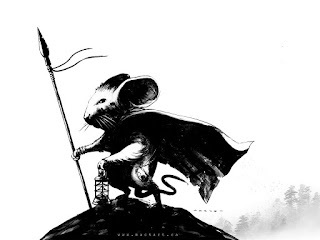 When I'm using those, I also use a textured brush (a stock brush called "drybrush") so that it adds a bit of randomness to the work as well as that Mouse Guard-ish pebbled texture. 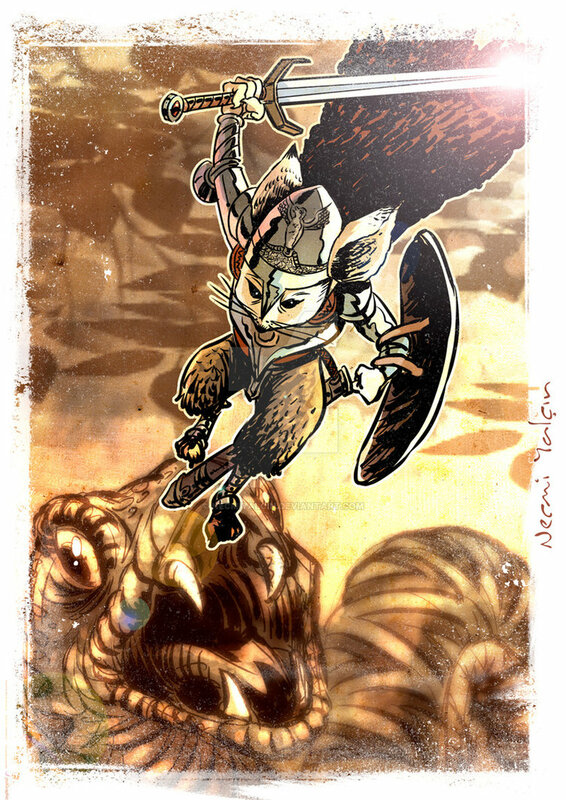 Here again is a photo of the printed poster art. According to the Art Bubble co-ordinaters, the poster is A3 sized on quality heavy stock. 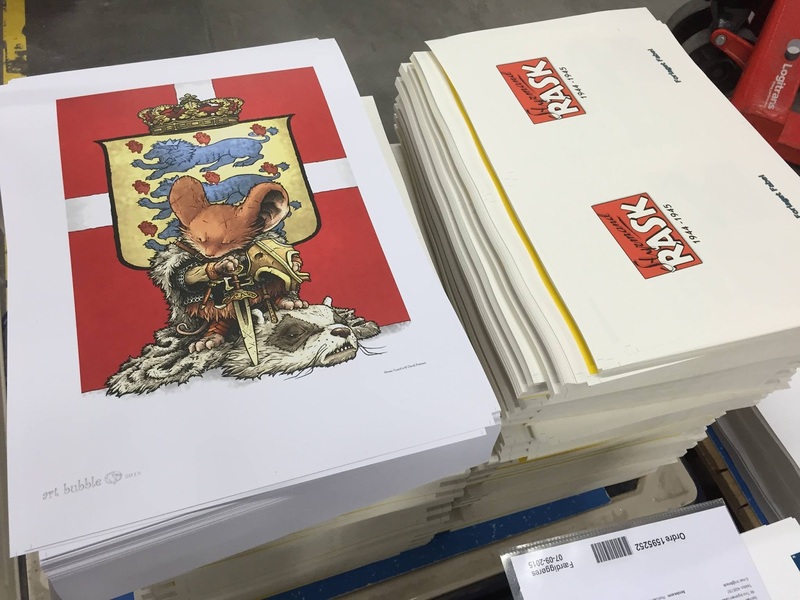 500 copies have been made and will be sold for 100 Danish Krones ($15) at the Festival in the Round Tower. If there are any left after the festival, Art Bubble is willing to sell worldwide for regular price and postage.